Catch & Release places you on a beautiful mountain lake and lets you freely explore and row around while you choose your fishing spots. Beautiful, relaxed experience. Just you. On a lake. Step into your rowboat, grab the paddles and dive into a meditative, relaxing VR fishing experience like no other. While you fish, you can listen to music on the radio, skip stones across the lake or use any of the many interactive items. Choose the right bait, pick a good fishing spot and cast your rod to get the biggest fish on the hook! But once you do, it’s not over yet. You’ll have to tire out your catch and win the fight before you can reel it in! The game is designed to enable players to unwind and play however they want, or you can take on missions to unlock new gear and interactive items to help you catch the biggest fish! Somewhere in the deep forests of North America, between the small village of Misty Falls, small creeks and waterfalls and far off the long windy roads, lies the beautiful lake Whispering Waters. Use the unique rowing mechanics to find the best fishing spots and explore the beautiful environment. Throw the line out and attract a fish – Your interactive fishing rod offers you full control, with different bait and lures and very immersive haptic feedback. Catch the biggest fish, fight to reel them in, but don’t let them snap the line and escape! You’ll need strategy and finesse to tire them out if you want to make the greatest catch! Original soundtrack with over 30 tracks playing on the in-game boat radio. Find trash or treasure. The lake hides more than just fish! It’s just you. On a lake. Make sure to check out all of the interactive items on the boat. There you will find a notebook that explains more details to you and also gives you missions. There is more depth to the game than meets the eye! For the past 17 years, we have established ourselves as a renowned game-services company that helped developers with their games. We have always prided ourselves of being busy supporting the best and biggest games over the last two decades. When the Virtual Reality hardware and software started to become a serious contender, we decided to grow our expertise in this field and launch a VR project. This became the project called “Catch & Release.” Our goal was to bring virtual fishing to the PS VR audience. 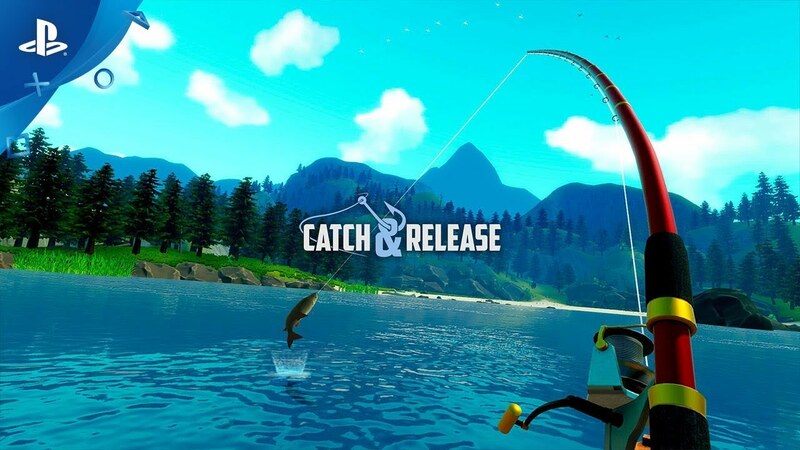 We feel that “Catch & Release” is a virtual reality fishing experience like no other - it combines the inherently relaxing activity of fishing on a lake with beautiful surroundings and game mechanics that take a step back to let the player enjoy their time on a virtual fishing trip freely and without stressful distractions like timers or forced missions. In short, we feel that this project allows us to grow as a game-services company in the VR industry. The game features one of the most beautiful environments in VR, brought to life with dense nature, local fauna (such as geese and bears) and diverse, interesting fishing spots and landscape features. The colorful artstyle supports the goal of immersing the player in a peaceful world free from stressful distractions and lets players engage with the game the way they feel like. We hope you guys enjoy it as much as we did in making it!